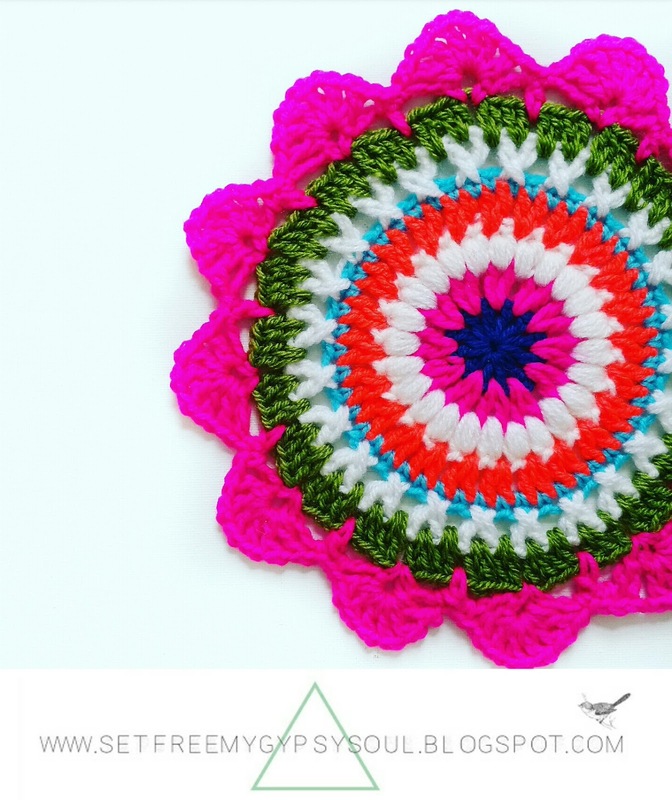 Looking for a quick and easy Mandala crochet pattern? 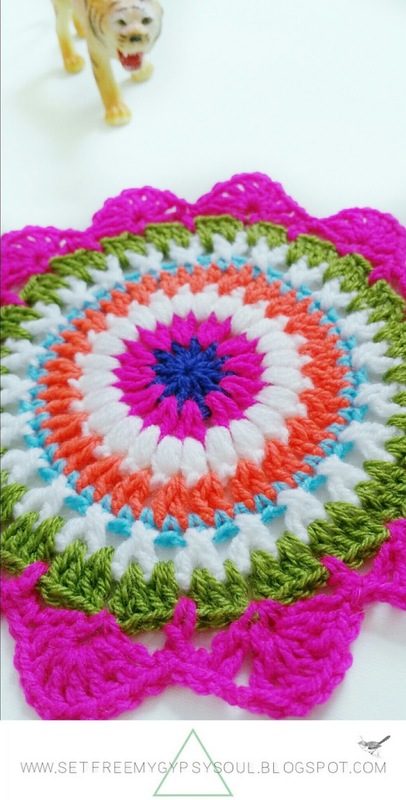 Try this pretty Bohemian-inspired Pink Pageant Mandala crocheted using puff stitch, treble (US double), and a fun criss-cross crochet stitch. Great for beginners! 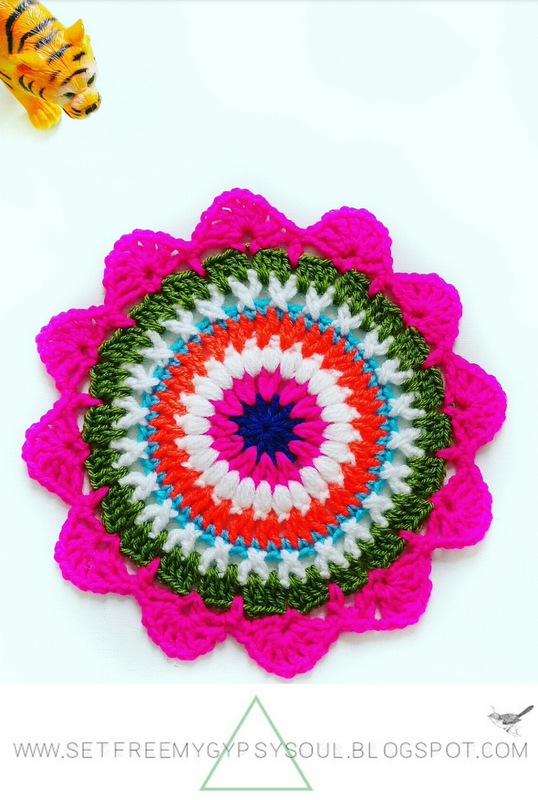 This week's Monday Mandala is perfect for those days you just want instant craft and crochet gratification! Working up super fast and crocheted with simple stitches, this one is great for beginners too! This one is made using a 5 mm hook and DK yarns and measures approx. 6.5 inches across. Round 1: Start with a magic loop and chain 3. This counts as your first tc (US dc). Now make 11 more tc (US dc) into the loop. Join with slip stitch and cast off. Round 2: cast on into any space and chain 3 as first tc (US dc). Make another tc (US dc) into the same space. Put another 2 tc (US dc) into each space around the work. Join with slip stitch and cast off. Round 3: cast on in any space and chain 1. 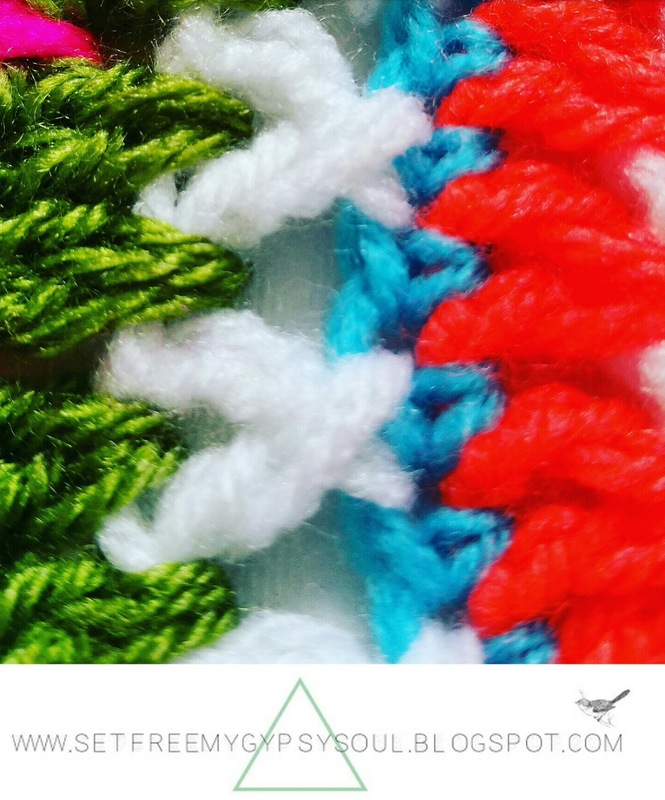 Make a 4 y/o puff stitch into the space and chain 1. Repeat around the work making a puff stitch into each space followed by a chain 1. Don't worry if your work if looking a little wavy, the next round flattens her and makes those puff stitches pop! Round 4: cast on in any space between puff stitches and chain 3 as your first tc (US dc). Now make another tc (US dc) into the same space. Move to the next space and make another 2 tc (US dc). Repeat in each space around the work. Join with slip stitch and cast off. Round 5: cast on in any space and make a dc (US sc) in every space around the work. Round 6: cast on in any space and chain 4. This counts as your first tc (US dc) plus a chain 1. Now, yarn over as if making a regular tc (US dc) but instead of making it into the next space, insert your hook into the space BEHIND/BEFORE your stitch. Skip a stitch in FRONT of that first tc (US dc) and make a tc (US dc) into the space. Chain 1 and make a tc (US dc) into the space that you just skipped (BEHIND/BEFORE). Again skip a space and make a tc (US dc) into the next one, then chain 1 and make the criss-crossing tc (US dc) into the space behind that you just skipped. Repeat around the work. Join with slip stitch and cast off. Round 7: cast on in any space and chain 3 as your first tc (US dc). Make another tc (US dc) into the space. Repeat around the work putting two tc (US dc) in each space. Join with slip stitch and cast off. Round 8: cast on in any space as your first dc (US sc). Chain 3 and make another dc (US sc) into the same space to form a loop. *Chain 3 and skip 3 spaces. Make a tc (US dc) into the 4th space and chain 3 again. Chain 3 and repeat * around the work. Round 9: chain 4 to count as a tc (US dc) and a ch 1. Now make 5 tc (US dc) + ch1's into the loop. You now have 6 tc (US dc) in the loop. Make a dc (US sc) just before your tc (US dc) from round 8 to form the shell. Now dc (US sc) again the other side of your round 8 dc (US sc) and chain 1. Make 6 tc (US dc) + ch 1''s into the next loop and then dc (US sc) again right next to the round 8 tc. Repeat around the work. Join with slip stitch and cast off, weaving in ends. 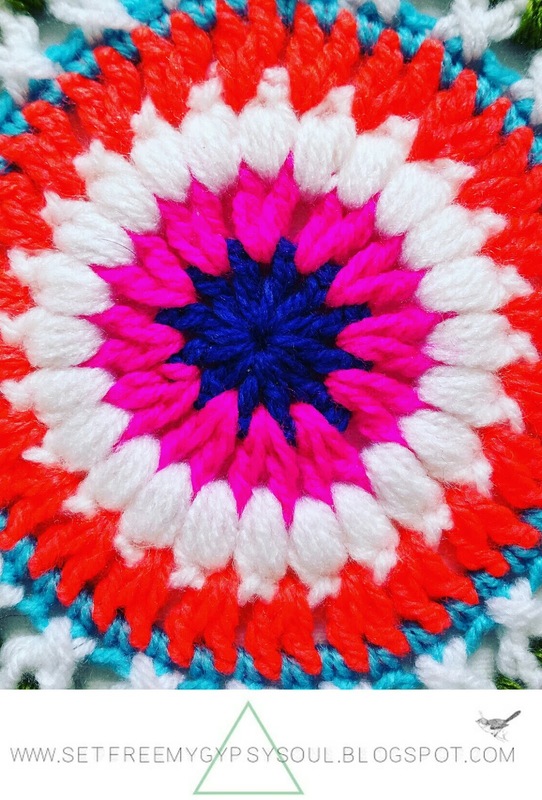 And don't forget to show me your version of the Pink Pageant crochet mandala on Instagram by tagging me @setfreemygypsys0ul or using the hashtag #SFMGS. I have also started a new hashtag on Instagram.. #SFMGSswoon to beat the new selective Insta feed and also to showcase bright, colourful, bohemian craft every week! Join the group now by tagging your work with #SFMGSswoon! 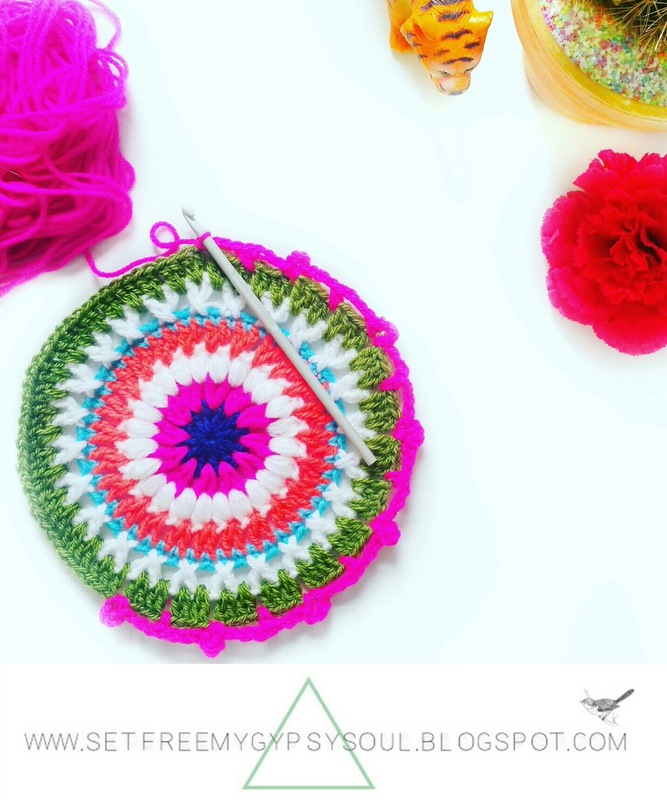 If you liked this crochet Mandala patern.. be sure to check out my other free Mandala patterns by clicking here!